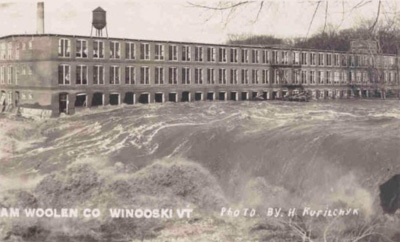 Known as one of Vermont's most devastating events, the 1927 flood took out 1285 bridges, miles and miles of roads and railroads, and countless homes and buildings. Eighty-four people died in the flood, including Lt. Governor S. Hollister Jackson. The flood occurred on November 2, 3, and 4 of 1927. Rainfall averages over this period of time range from four to nine inches total. Had this been an isolated event of extreme rain the effects would not have been so severe. The month of October, 1927 saw one hundred-fifty percent more rain than normal. In Northern and Central Vermont there was nearly three hundred percent more; this completely saturated the ground. Since the periods of heavy rainfall in October were spaced apart flooding did not occur. These factors, combined with the fact that it was autumn, a season where most vegetation was already dead or dying, lead to what is still known as Vermont's greatest disaster. The lack of plants and the deforestation of Vermont may have played a minor role in the grounds ability to absorb water. For the soil to be able to hold on to some amount of water it has to have plants which can consume that water, and with no plants or trees and heavy rain, the excess runoff has no other place to go than into the rivers. A cold front moved into the area from the West, and the rain started the evening of November 2. The convergence of the cold front, with a low pressure system that was moving up the Northeast coast caused a strong southeast air current forcing the storm into Vermont. When it reached the Green Mountains moist air was forced to rise, causing torrential downpours on November 3. The rain was most intense in Central Vermont, East of the mountains, and the highest recorded rainfall was 9.68 inches in Somerset. 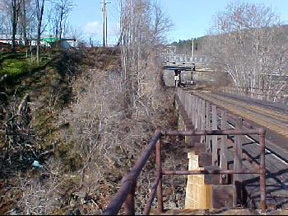 Historical (left) and re-photo (right) of a railroad bridge in Bethel, VT. Little has changed in this area since the flood. The cause of the 1927 flood cannot be attributed to one single factor, but a combination of many. The excess rain during the month of October saturated the soil to the point where it could not hold anymore. The final factor, the excessive rain culminating on November 4, pushed the landscape over the edge. The water ran into the already high rivers, causing mass flooding all over the state. 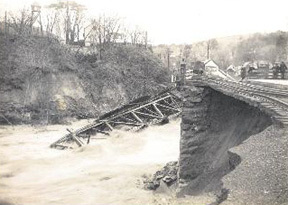 The flood greatly changed the landscape, causing failing on slopes, destruction of homes and bridges, and forcing a mass rebuilding effort in all counties.